Windows Live is FINALLY extending it's long announced integration with third party services, adding twenty new Web Activities to the current list of Daum, Photobucket, StumbleUpon, Flickr, TripIt, Flixster, Twitter, iLike, Yelp, Pandora, WordPress and any custom RSS-reed. Sometime next week, you'll be able to add the following services to your Windows Live Profile: Arto, Bilddagboken, Dada, Dailymotion, Digg, Facebook, Fotolog, Hevre, Hyves, Last.fm, LiveJournal, MClub, metroFLOG, MSN, Overblog, SmugMug, The Zune Social, TypePad, wow.ya.ru and Zoo. Some of these sites are popular in specific regions only, but there's no doubt the likes of Facebook and Digg will become crowd favorites fast. That What's new feed in Messenger and Hotmail is finally going to see some serious updating action. >> Read the announcement post by Rob Dolin on Windows Live Wire. The Windows Live team reports that Web IM has (or will) become available to Windows Live Hotmail users in Brazil, Canada, China, Germany, the Netherlands, Norway and the USA. The feature had already been rolled out last month to users in France, Italy, Japan, Mexico, Spain and the UK. Now you can send instant messages from the Windows Live Hotmail and People pages! This means that, even if you’re on a public computer where Windows Live Messenger isn’t installed, you can still send IMs to your Messenger contacts! You can sign in by clicking the Messenger dropdown menu on the top right (next to Options) and you can do so automatically every time you log into your inbox, or one a per time basis. In e-mails received from Messenger contacts, their statuses (green for available, yellow for away and red for busy) will appear next to their names. Click the name to immediately start an IM conversation. Your own presence status will only be broadcasted to your Messenger contacts. The Windows Live team is also suggesting that you can "sign in to web Messenger and regular Messenger at the same time, with different IDs.". Polygamy, eh? - default emoticons and static Display Pictures. - Multiple points of presence. - Custom content such as Messenger scenes, Dynamic or Animated Display Pictures, custom emoticons, etc. - Change your Display Picture, Display Name and Personal Status Message from within the client. - Conversation history (except when using MPOP). 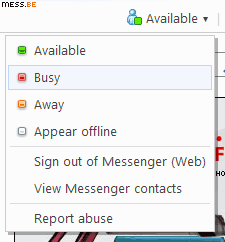 Also, the regular MSN Web Messenger client remains unchanged.